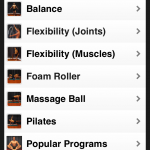 This is an app review for PhysioAdvisor, an app that contains physical therapy exercises for patients to use at home. iMedicalApps is an independent online medical publication for medical professionals, patients, and analysts interested in mobile medical technology and health care apps. Our physician editors lead a team of physicians, allied health professionals, medical trainees, and mHealth analysts in providing reviews, research, and commentary of mobile medical technology. Our publication is heavily based on our own experiences in the hospital and clinic setting. All contents © copyright 2019 iMedicalApps. All rights reserved. Login or register on iMedicalApps, the registration process is free. Login on the left or click the register button below to proceed. Login or register on iMedicalApps to view videos, the registration process is free. In order to access our videos, you need to register on iMedicalApps, the registration process is free. Login or register on iMedicalApps to download files, the registration process is free. In order to download our custom files, you need to register on iMedicalApps, the registration process is free. Login or register on iMedicalApps to rate apps, the registration process is free. In order to rate apps, you need to register on iMedicalApps, the registration process is free. Create yout dual account for both iMedicalApps and MedPage Today! I intend to use MedPage Today as a source of free CME/CE credits. iMedicalApps is the leading online publication for medical professionals, patients, and analysts interested in mobile medical technology and health care apps. MedPage Today is the leading news-gathering organization for physicians in the world, covering 130 medical meetings and 30 specialties. Congragulations on your successful registration! Log in to continue. Click on the login link in your email. Insert a new password in the form and submit. Click on the log in link. Login using your email and password you just set. Your password has been successfully reset! Log in to continue. Please login or register on iMedicalApps, the registration process is free.